Dr. 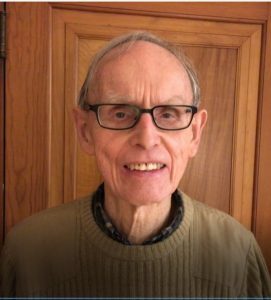 Basil Clark is emeritus professor at Saginaw Valley State University. He taught composition and literature, with a special interest in early British writers. He enjoys the study of languages, and is reviewing Latin in retirement. Creative 360’s Yes We Can! evenings offer an opportunity to hear from and about an array of fascinating seniors. An evening of entertainment, they offer a chance to learn something new, enjoy poetry, and enjoy a concert of fabulous music from “America’s most entertaining classic jazz band since 1970,” The New Reformation Band. The remaining evenings are scheduled as follows. Friday, February 15, 7-8:30 p.m.: The New Reformation Band in Concert. Wednesday, March 13, 7-8:30 p.m.: Naughty, Bawdy and Wise, Chaucer’s Faliau Performance with Commentary by Dr. Basil Clark.